It was october 2009 when we found this piece of jewellery in St. Blasien. The restaurant as well as the holiday flats stayed empty for five years. We had to change this situation and decided to give this house a new life. On the first of Dezember 2009 was the opening of our holiday flats. It now is called Silva Nigra. 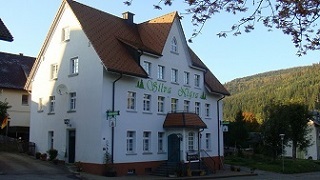 Silva Nigra is latin and means Black Forest. As the Romans came to the border of the Black Forest about 2000 years ago they gave it the name Silva Nigra. December 2010 was the expansion of our holiday flats: Our new house has the spanish name Selva Negra (Black Forest).